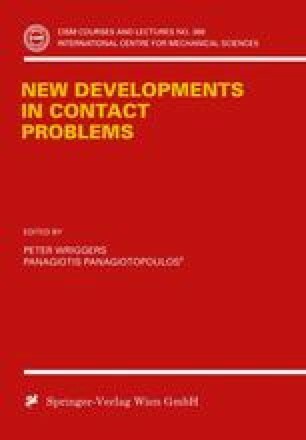 This chapter is an introduction to unilateral contact mechanics by means of a simple discrete problem using recent tools of nonsmooth analysis. The emphasis is on phenomenon mechanical modelling rather than on problem mathematical formulating or numerical solving. To begin, the general principles of kinematics, statics and energetics which govern the relation and interaction of two bodies in contact are briefly covered. Then the basic tribological law of normal unilateral contact is discussed at length, using modern nonsmooth (convex and nonconvex) analysis. Many figures illustrate some abstract concepts introduced. The mathematical level is deliberately kept elementary.